FRESNO, CA -- For Tori Gaitan, finishing first is becoming a habit. For Liam Anderson, what better way to open his season with an impressive victory. It was those two all-too-familiar names on top in the Championship division races at the 40th Clovis Invitational on a picturesque day at Woodward Park. Gaitan, who has won at Woodbridge and Bob Firman previously, needed to overcome an impressive freshman and hold off two others with extensive experience on the undulating 5K layout that also serves as the state championship course. Anderson, the defending CIF Division III champion who was competing for the first time this season, held to the top pack throughout before making his move late and pulled away from a who's who of the state's best: Great Oak's Tyler Tickner, Newbury Park's Nico Young, Dana Hills' Simon Fuller, and JSerra's Anthony Grover. Anderson's time of 14:57 is the sixth fastest in the last decade of the invitational and only the eighth under 15 minutes at the meet over the past 10 years. He was second last year in 15:03. Tickner, a senior, finished in 15:08.40 and Young, the Woodbridge champion, crossed in 15:09. Fuller, who won the Dana Hills Invite and helped the Dolphins' impressive showing a week ago in New York, finished in 15:16.40. Grover, the defending State Division IV champion, was fifth in 15:17.80. Both Young and Grover are juniors amid a group of 12th-graders. Great Oak's boys, who impressed most recently at the Bob Firman Invitational near Boise, Idaho, went 1-6-7-12-15 for 41 points, a 23-second 1-5 split and a 15:22 average. The Wolfpack boys won for the fifth consecutive year. Last year they won with 81 points. Behind Tickner was senior Cameron Hylton (7th in 15:19.70), junior Gabriel Abbes (8th in 15:21.40), sophomore Mateo Joseph (15th overall, 12th among scoring runners in 15:28.70), and senior Ryan Shields (18th/15th in 15:31.90). Newbury Park was second with 142 points (57 second 1-5 split), West Ranch, led by senior Evan Bates' sixth-place finish (15:19.30), was third with 154 points, and Dana Hills, competing for the third consecutive week, was well back in fourth with 214 points. The anticipated matchup between Anderson, who was also the State 1600m champion on the track, and Jesuit junior Matt Strangio, the 3200m champion on the track, did not happen. Strangio has been slowed by injury and hardly competed in September. Gaitan's winning time of 17:09.70 equalled the ninth-fastest time on the course by a junior and is the fourth-fastest time by a junior at the Invitational. 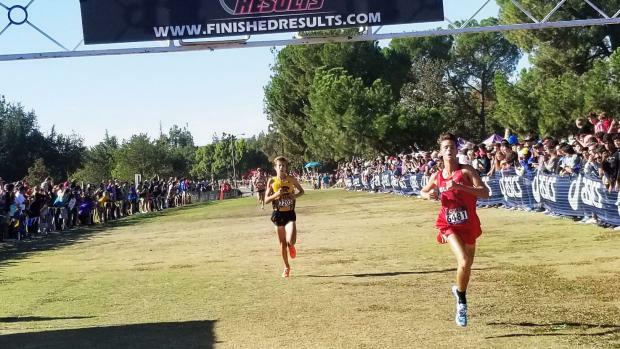 But at the two-mile mark of the 3.1-mile race it was Del Oro (SJ) freshman Riley Chamberlain with about a 10-yard lead over both Gaitan and Buchanan junior Corie Smith, the defending State Division I champion who just happens to train on the Woodward Park course. Gaitan, however, closed strong and held her sprint up the grass area to finish just three seconds ahead of Chamberlain. The time for Chamberlain (pictured) of 17:12.70 is a meet record for freshman and the fourth-fastest ever on the Woodward Park course by a freshman. Smith, a junior, was third in 17:19.10 with her teammate and training partner Meagen Lowe fourth in 17:31.90. Oak Park senior Sarah Shulze continued her impressive fall placing fifth in 17:35.20 just ahead of the Great oak duo of senior Fatima Cortes (6th in 17:43.60) and junior Arianna Griffiths (7th in 17:49.40). Shulze, who won at Cool Breeze earlier this fall, was 17th here a year ago in 18:02.1. Chamberlain wasn't the only younger classman to impress. 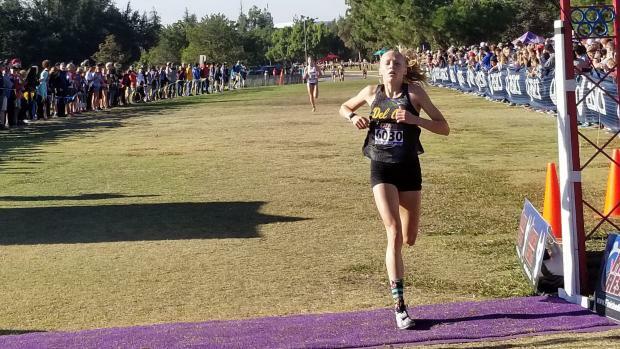 Simi Valley sophomore Jill Walker was 9th in 17:53.80, Amador Valley sophomore Hope Bergmark was 11th (18:04.10), and Serrano freshman Tiani Goeson was 12th (18:04.80). Carlie Dorostkar, a junior from Canyon Crest Academy (SD), who won at Dana Hills, was 10th (17:56.20). 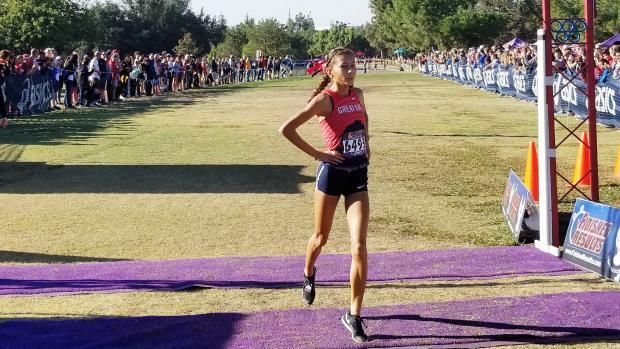 As was the case with the boys, the Great Oak girls were dominant, rolling up 64 points, well ahead of runner-up Sacramento St. Francis (166), Phoenix Xavier College Prep (183) and Buchanan (183). And as with the boys, it was the fifth consecutive team victory for the Wolfpack ladies with marked improvement over their 2017 winning total of 102. Also scoring for Great Oak were junior Audrey Dang (26th overall, 21st for team scoring, 18:31.40) and junior Aubrie Nex (39th/31st in 18:55.50). Great Oak closed strong going from pacing for 98 points through the first mile, to 72 points through the second mile to 64 points at the finish. 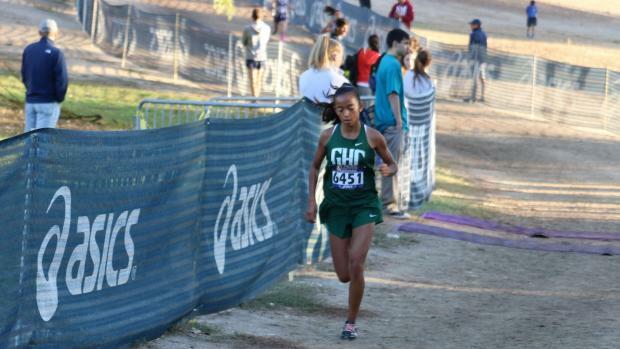 Another freshman girl who stood out, albeit not in the Championship division race, was Granada Hills Charter's Sofia Abrego (pictured), who ran the 11th fastest overall time at the meet (18:00.30) to win the Varsity Girls XL School division. Hailey Kirsch, a junior at Valencia (SS), was second in 18:18.30. Emily Perez, a senior at St. Joseph Notre Dame (NC), won the Varsity Girls Small School division in 18:06.70. Mia Barnett of Village Christian (SS) was second in 18:50.60.